Webmaster's note: take a guided tour of the Dean Cornwell collection at Steamboats.com. Collector Dave Thomson is your guide in this wing of the online museum. This weekend I made high resolution scans of the large limited edition lithograph of the Boatman's Bank of St. Louis's painting by Dean Cornwell of THE RACE OF THE NATCHEZ & THE ROB'T E. LEE. After assembling the 3 scans (left, right & center) I made an effort to correct the color which had an amber cast to it as if the painting had a heavy coat varnish on it that gave the boats a sun tanned appearance. 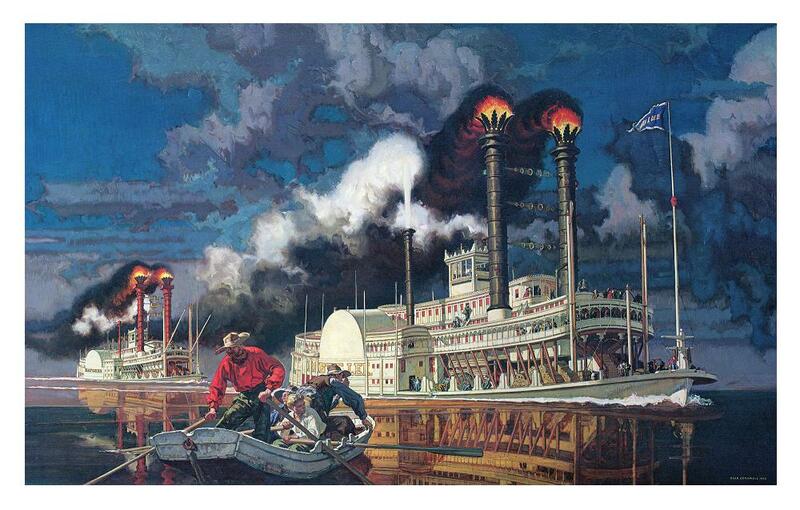 Here the NATCHEZ & LEE look more like boats that had been painted white and what you can see of the sky behind the smoke and steam looks more "true blue." Cornwell painted this enormous work of art (I went to see at the bank in St. Louis in the early 1980's and it appeared to be about 15 X 10 feet or thereabouts in size) in 1950, the lithographs were printed in the 1970's. I felt fortunate to find one one of the lithographs on eBay back in the mid 1990's for around $50 from a dealer in St. Louis. Jim Hale in Alabama said he obtained one of these lithographs in the 190's after an issue in the S&D Reflector included an article about where to order it. These are pretty rare, I haven't seen one on eBay since I got a purchased mine. On eBay these days you will find postcards of the painting on them and Seagram's Gin used an earlier version that Cornwell painted in a 1947 magazine advertisement, that smaller painting must have been the basis for the Boatman's Bank version. That much smaller painting of the Race by Cornwell is in the Ohio River Museum at Marietta. 19 1/8 X 23 1/4 lithograph from 1973, probably by an artist imitating Dean Cornwell's style although by comparison the RIVER BELLE here is more in the realm of commercial illustration or calendar art. Cornwell more than likely saw this and may have winced a bit since it's pretty raw compared to his beautifully finessed paintings of steamboats. Those stacks certainly are larger in diameter than average and the elaborate design in the half circle above the name on the paddlebox is a contrivance which I don't recall seeing in photos of on any of the Western Rivers boats. The stages out front, the main and boiler decks are pretty successful, the pilot house on the Texas deck is rather squat like the ones on boats where a Texas was added after the boat had operated for a while and the height of the pilot house was often made shorter on those occasions. I scanned this in 2 halves, left and right, cobbled them together in Photoshop, retouched some paper scrapes that were in the upper right and made a color correction to reduce the green tone which prevailed in the original. Cornwell's BETSY ANN cover of TRUE magazine FEB 1953. Dean Cornwell's painting/illustration of Fred Way's BETSY ANN on the cover of TRUE magazine FEB 1953. 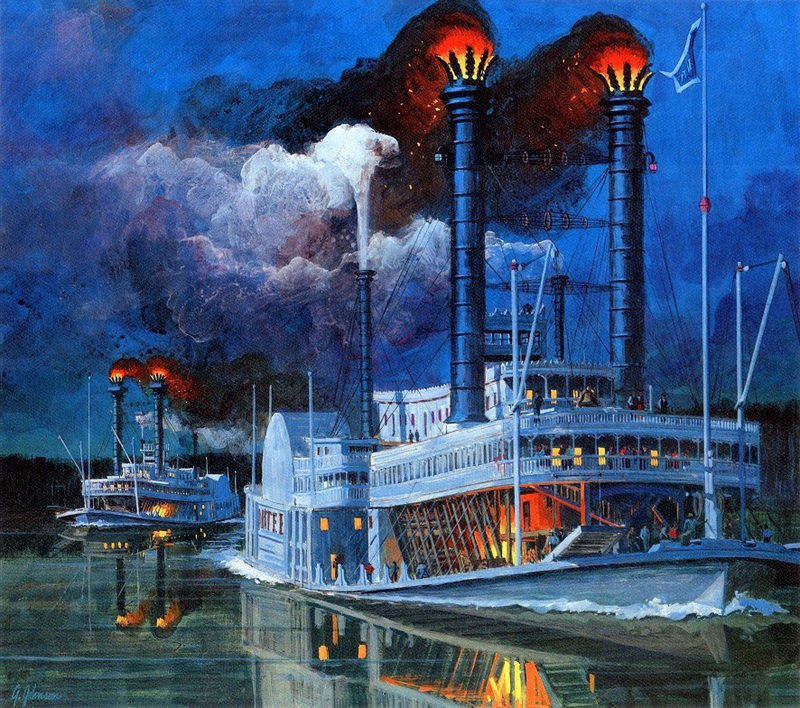 Cornwell's painting/illustration accompanied Ben Lucian Burman's story LOW WATER ON THE MISSISSIPPI pages 52 and 53 of the same issue of TRUE. Both of these paintings belong to the Sons & Daughters of Pioneer Rivermen and are on display in the Ohio River Museum at Marietta, Ohio. 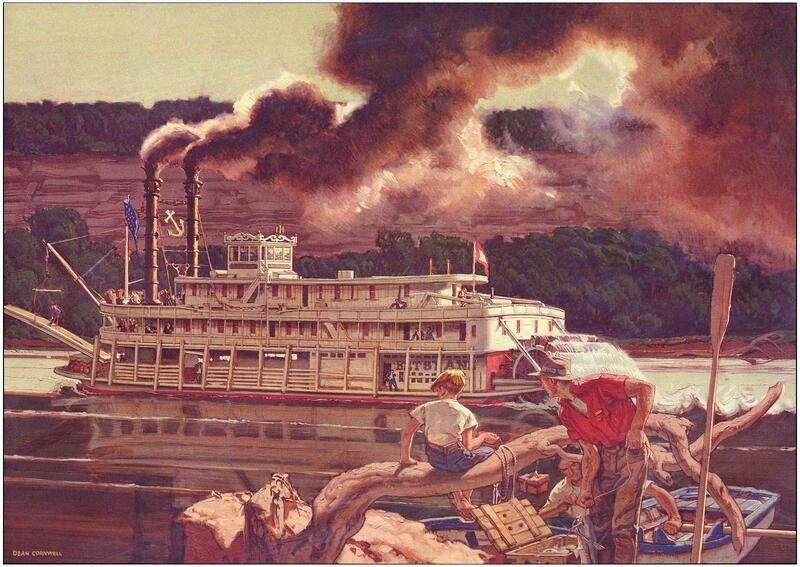 Print of a painting Cornwell made for an Early Times Whisky Ad '52 of the BETSY ANN which was entitled Kentucky River Boat and measures 11 3/4 X 13 3/4 inches floating inside 16 X 20 (margins on all 4 sides). It appeared in the same TRUE magazine issue that had Cornwell's BETSY ANN steaming towards us on the cover and the Cornwell double page illustration of the TENNESSEE BELLE pilot house done for the Ben Lucien Burman story. 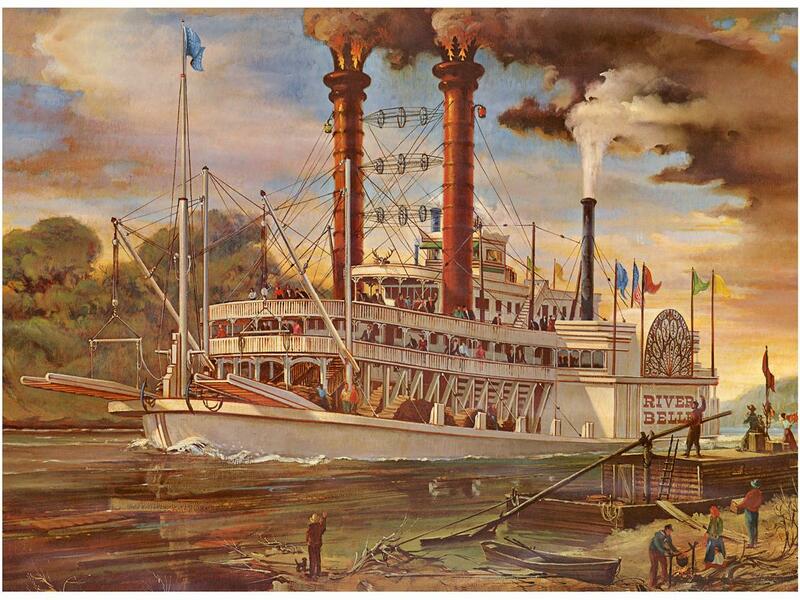 Cornwell's "Kentucky Riverboat" painting of Fred Way's BETSY ANN and a greeting card take-off signed with the initials F.S. Attached custom scan of the cover of a 4 1/4 x 5 1/2 mini memo book from 1958 (I touched out the staples and fold crease at center that held the pages inside). Obviously based on Cornwell's Race of Natchez and R.E. 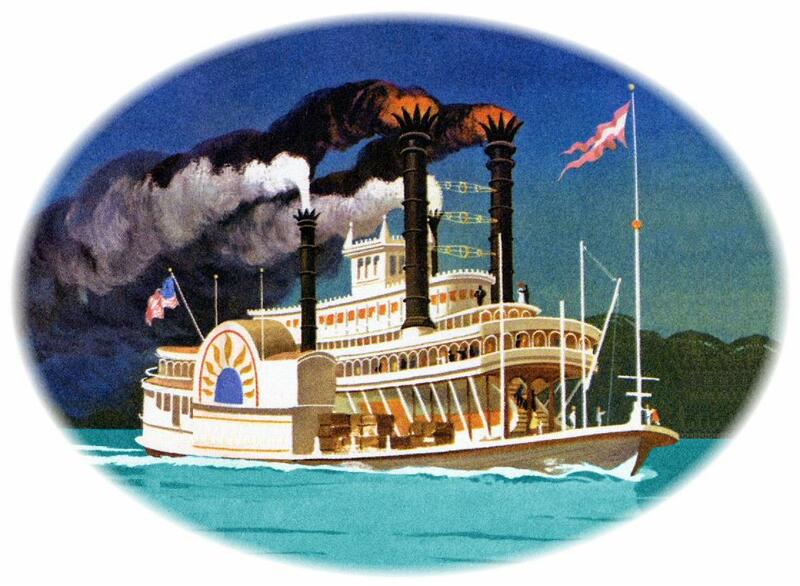 Lee except with a sternwheeler heading in the opposite direction on the left side instead of an approaching sidewheeler. The river looked like a pea soup so I neutralized it to a blue green. On the paddlebox was crude lettering that spelled out "MAIL PACKET" which I removed. This illustration style was trendy in the '50's, took a lot of skill to control the medium which appears to be a combination of watercolor and gouache. 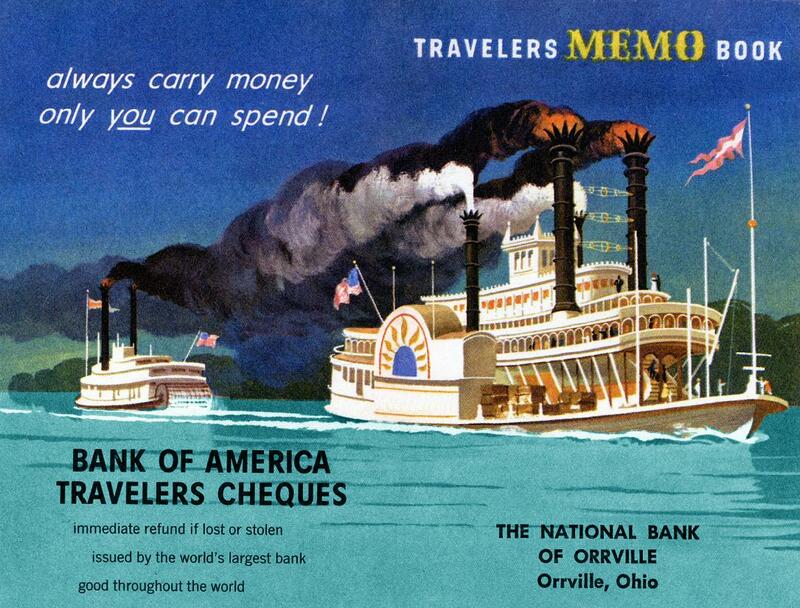 From the Travelers Checks Memo cover I extracted the primary steamboat and extended the background on all four sides and put it inside an oval vignette suitable for framing. This Western pulp novel from England (there is no publishing date but probably mid to late 1950's) is noteworthy because the illustrator "Dimmock" copied Dean Cornwell's painting of the BETSY ANN from the cover of TRUE men's magazine Feb 1953 for the steamboat that fills the lower portion of the cover. 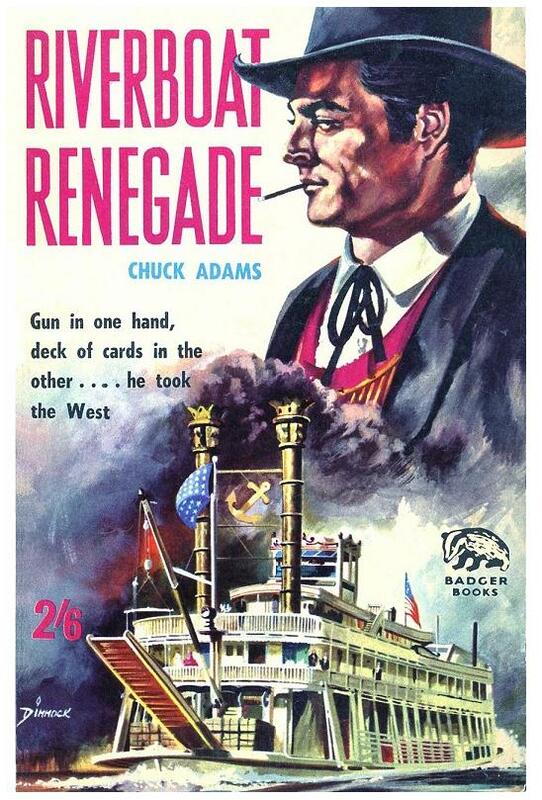 The profile of the gambler (named "Darcy Kane" in this novel RIVERBOAT RENEGADE by Chuck Adams) resembles the Hollywood actor Robert Lowery who appeared in many Westerns, both feature films and television series. As he got older Lowery's face began to resemble superstar Clark Gable's as he looked in later years. Colorful advertising art by Gordon Johnson for Atlantic Insurance circa the 1960's. Perhaps influenced by Dean Cornwell's painting of the 1870 race of the NATCHEZ and ROB'T E. LEE. Attached is Dean Cornwell's painting/illustration for Ben Lucian Burman's story LOW WATER ON THE MISSISSIPPI, published in TRUE magazine FEB 1953. This image covered pages 52 and 53 so I had to close the gap and touch out the seam where they joined together. This is inside the pilot house of the Tennessee Belle and the patina on everything is marvelous as well as the authentic wardrobe on Captain, pilot and steward. 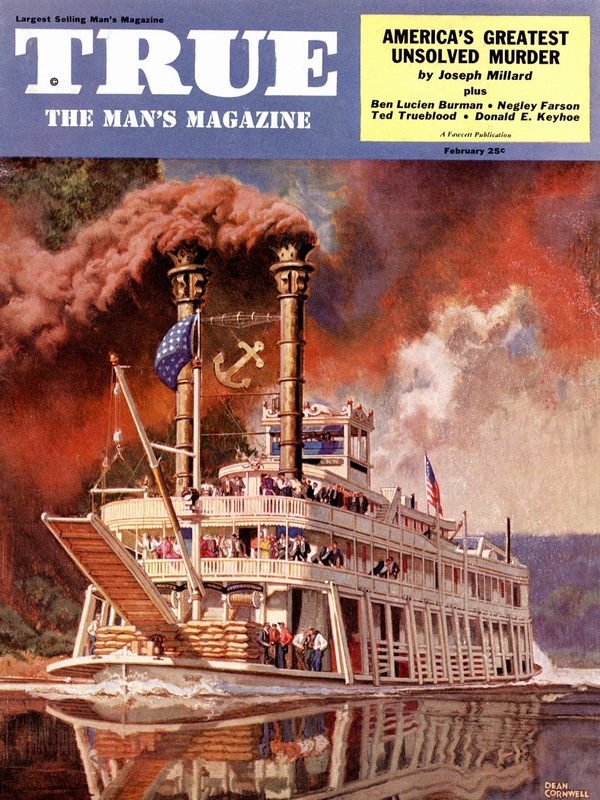 The cover of the same issue of TRUE featured on of Cornwell's paintings of the Betsy Ann. Both paintings are in the Ohio River Museum at Marietta. When I come across the cover I'll scan that also. Dean Cornwell's painting/illustration of Fred Way's BETSY ANN which appeared on the cover of TRUE magazine FEB 1953. 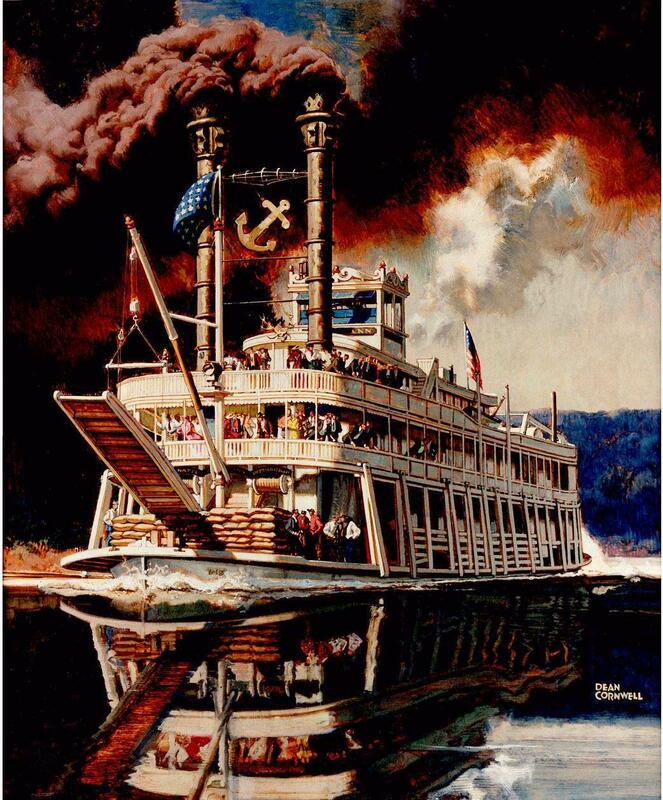 Cornwell's painting/illustration for Ben Lucian Burman's story LOW WATER ON THE MISSISSIPPI covers pages 52 and 53 in the same issue of TRUE. Both of these paintings belong to the Sons & Daughters of Pioneer Rivermen and are on display in the Ohio River Museum at Marietta, Ohio. 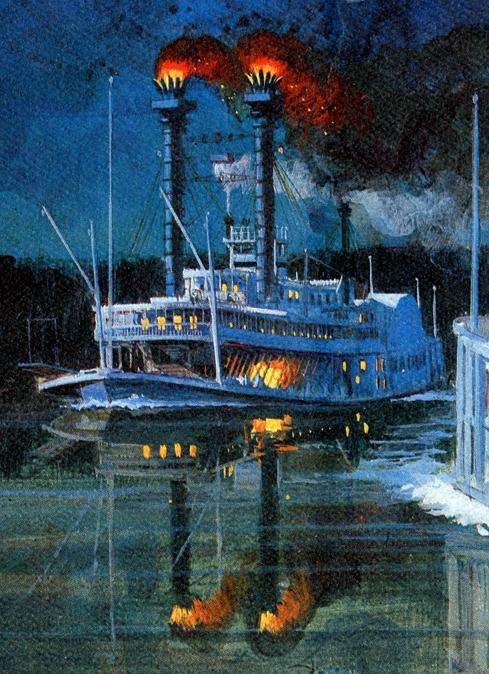 This wrap-around cover for the graphic novel version of FEVRE DREAM features a steamboat based on the ROB'T E. LEE in Dean Cornwell's painting of the race between the NATCHEZ and the LEE. 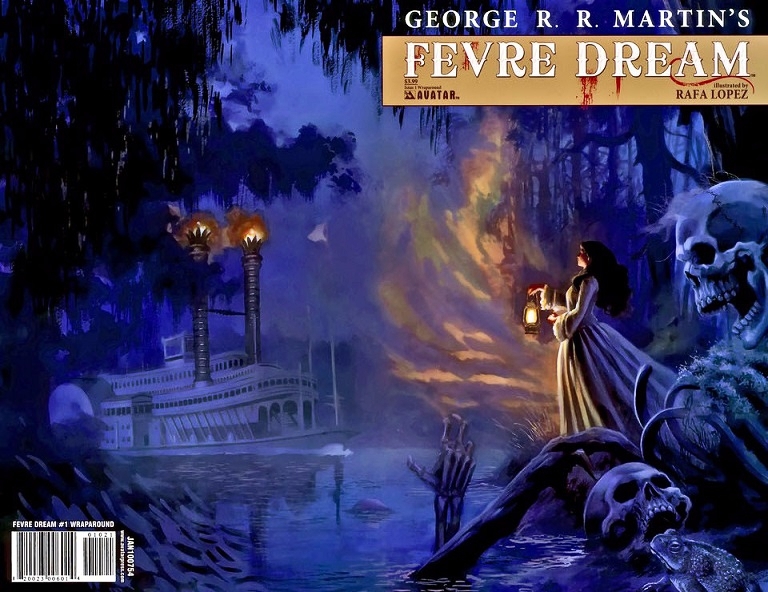 FEVRE DREAM is a 1982 vampire novel written by best-selling U.S. novelist George R. R. Martin who is best known for the novels he route upon which the series GAME OF THRONES is based. The novel is set on the antebellum Mississippi River beginning in 1857; it has been described by some as "Bram Stoker meets Mark Twain. The book was first published in the U.S. in 1982 by Poseidon Press and still remains in print. It was reprinted in 2001 by Orion Books as volume 13 of their Fantasy Masterworks series and was nominated in 1983 for both the Locus Poll Award and World Fantasy Award. Martin's novel apparently influenced Seth Grahame-Smith's 2010 novel ABRAHAM LINCOLN VAMPIRE HUNTER which contains many of the story elements in FEVRE DREAM. The spelling of "Fevre" was derived from the original name for the Galena River, a tributary of the Mississippi that runs past Galena, Illinois. The river was originally known as "Rivière aux Fèves" and "Bean River" due to the large amounts of wild beans that grew along its banks. Following English language code-switching of the French river name "Rivière aux Fèves", the river name was corrupted and was eventually referred to in English on maps as Fevre River, later changed to the more conventional spelling Fever River. This is an illustration by "Francisco Redondo" (either the artist was of Spanish descent or he made his name out of two California place names, San Francisco and Redondo Beach). It's from a 61 page 1973 children's "graphic novel" adaptation of Mark Twain's "Huckleberry Finn" published by Pendulum Books. 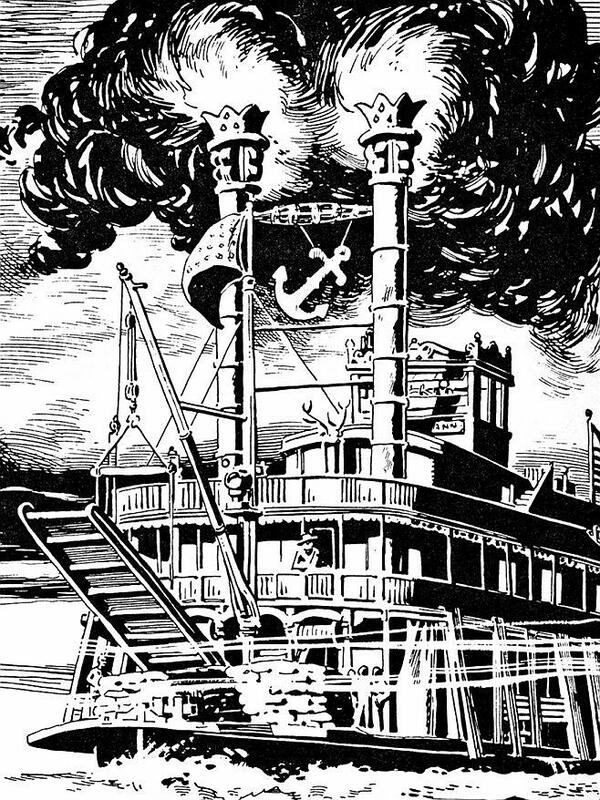 Senor Redondo copied Cornwell's cover art of the BETSY ANN for his TRUE magazine cover from February 1953, making if look a lot like a woodcut. The photo on the left of Fred Way's BETSY ANN from the Murphy Library makes an interesting comparison to Dean Cornwell's painting of the boat that was featured on the cover of TRUE magazine in February, 1953. The foreshortening and change of scale to the looming swinging stage in the foreground of the photo was expertly handled by Cornwell to make it less obtrusive. 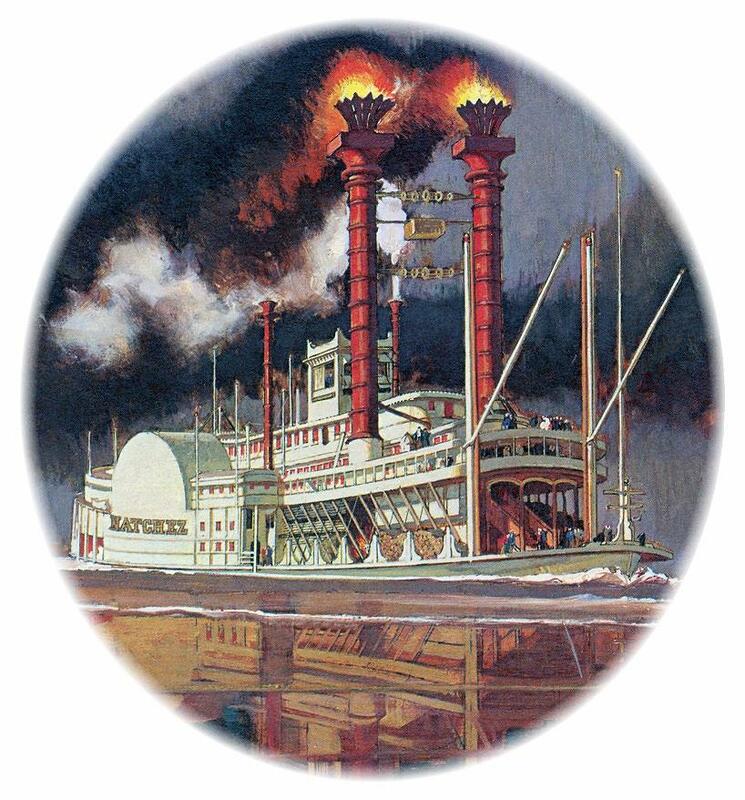 The smokestacks are bigger in diameter in the painting, with fancy crowns on top and with the anchor suspended in between. The treatment of the "fancywork" on the roof of the pilot house dates from 1930 when Fred Way came up with the beautiful design to replace the old railing after it had been raked off by the branches of a low hanging sycamore tree. The height of the railings on the boiler deck and hurricane roof are opposite in proportion from the photo to the painting. In the photo the railing treatment is narrower above, wider below, in the painting that is reversed to higher on the hurricane roof and narrower on the boiler deck. There is no railing treatment on the roof of the Texas cabin, instead it is constructed of solid lumber. "Muse Air Makes Flying Beautiful"
The boat itself may have been generated with an embossing technique in which a dye was made from Cornwell's art then pressed into a special paper stock and a custom finishing element would clean cut the edges. 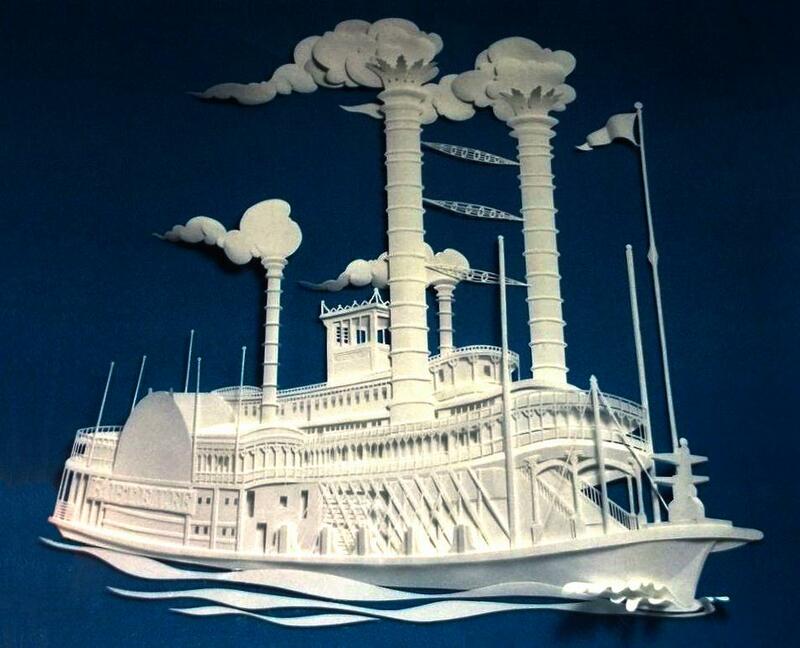 The smoke from the stacks and the water seem to have been cut by hand and assembled with the boat over a neutral navy blue background then the piece would have been photographed. The last phase would have been to add the lettering as a separate element in preparation for printing the travel poster.